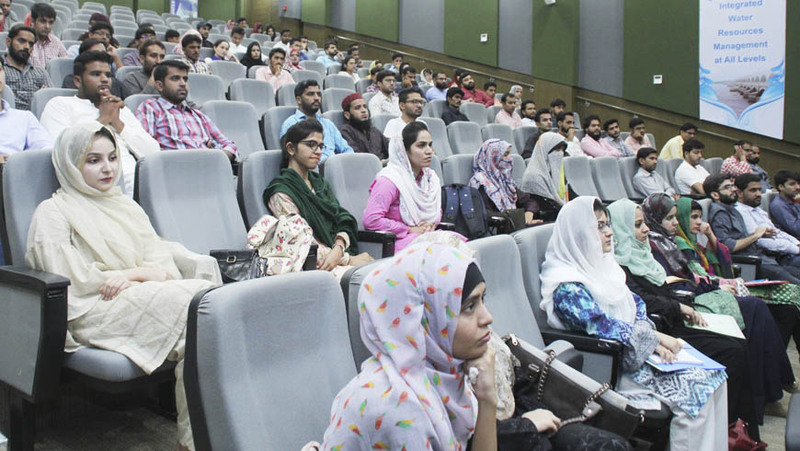 A welcome and orientation ceremony for the fifth batch of Master of Science (MS) students’ fall session 2018 starting at U.S.-Pakistan Centre for Advanced Studies in Water (USPCAS-W), Mehran University of Engineering and Technology (MUET) Jamshoro, was held on Tuesday. 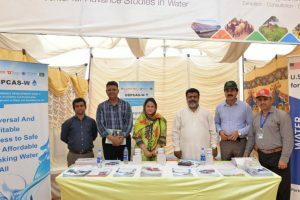 Speaking in the ceremony, Project Director USPCAS-W MUET Dr. Bakhshal Lashari said that water plays an important role in the economic development of any nation. He said that water scarcity now emerges as a global challenge and the countries like Pakistan faces acute shortage of water. He said that water sector plays an important role in the economy of Pakistan whereas due to the diminishing of this natural source, owing to rapid growth of populations, exposes to the need of efficient and critical management of the sector in the country. He said that the after four-year negotiating, the United States Government through the United States Agency for International Development (USAID) and the Government of Pakistan through the Higher Education Commission (HEC) had established the state-of-the-art centers for advanced studies in water, energy, agriculture and food security sectors of the country by partnering the universities from the United States. He said that MUET Water Center is one of leading regional centers of excellence in water in South Asia technically supported by the University of Utah, USA, which is the Partner University of the Center and other American universities in its consortium. He elaborated that USPCAS-W is educating and training the next generation of scientists, engineers, and policymakers through innovative academic and research programs crucial for Pakistan’s development in the water sector. “The Center with its best performance will emerge as one of the global centers in the water sector,” he said. “No compromise on the quality education,” he added. Dr. Lashari congratulated the newly enrolled students at MUET Water Center and said that they were the luckiest to be part of the Center and will contribute for the sustainable solutions to the water challenges faced by Pakistan. He further stressed on them to work hard, keep themselves well-disciplined and fully involved them in the water research. Speaking in the Ceremony, Dr. Jeffery Layton Ullman, Associate Research Professor at the University of Utah (UU), USA and the technical advisor to the Center said that USPCAS-W is committed to change the academic culture of Pakistan through the partnership, which also encompasses curriculum development, teaching, mentoring, research, and establishment of new laboratories. 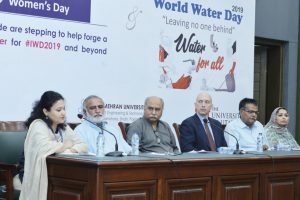 Dr. Ullman said USPCAS-W offers scholarships of higher studies and research in the water sector, while the University of Utah provides technical support to produce water leaders in the country. 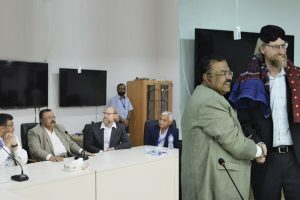 “The University of Utah is eager to provide technical support, education and modern applied research techniques for the water sector in Pakistan,” he added. Dr. RasoolBux Mahar, Deputy Director (Academics and Research) while sharing the academic guidelines and research process said that research plays a vital role in post-graduation studies. He noted that the graduates of the Center through the acquired advanced research skills would contribute to the global water challenges of a world at large. Dr. Kamran Ansari, Director Career Counseling,andPlacementbriefed about the academic guidelines and introduced the faculty to the enrolled students. He said that as per requirement 90 percent attendance is mandatory which also help the students to be shortlisted for the exchange program – the key component of the Center. Engr. Mujawar Malik and Monitoring and Evaluation Specialist ShahidPanhwar conducted a session on Moodle Learning Management System (LMS). The students of 5th batch also had a guided tour to the Center and laboratories. On this occasion, the faculty and students of the Center attended the Ceremony. Total 86 including 25 female students enrolled in different MS programs including Hydraulics, Irrigation and Drainage (HID), Integrated Water Resources Management (IWRM), Environmental Engineering (Env.Eng) and in Water, Sanitation and Health (WaSH) Sciences at MUET Water Center.